Simple. Tell us a little bit about the person. In less than 7 days, we turn that info into a unique song! You can listen to sample songs here or take a look at your song options here. We don’t just fill in the blanks. We create all unique custom songs based off your story. It doesn’t need to be romantic, we write songs for all occasions. You will receive your song in 7 days or less if needed so don’t stress about last minute gifts. Create a song as part of your speech, give it to your partner on the morning of your wedding or send it to be played in your absence. Guaranteed laughs and tears! Tell us about how you met, the funny stories, the romantic stories and we’ll turn it into a song for you to play on your anniversary. Just watch their face as they listen! A good chance to have some fun with a birthday gift. Let us create a birthday song and give something that will be kept and replayed as long as music is around. We have created songs and campaigns for brands like BankWest, Oreo and Jacob’s Creek as well as smaller brands. Check out our previous work or get in touch to chat. With music, there really is no limit to what we can do and of course, it doesn’t have to be romantic. Valentine’s Day, Mother’s Day, Father’s Day, Funerals, a colleague’s farewell – name it and we can do it! Performing live is where we started. We love to sing, perform, entertain and be in front of the camera. Pop us a message if you have an upcoming event and see how we can help. 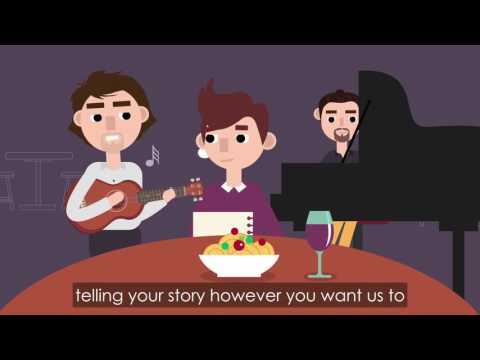 Your Story – You complete the info form telling us about the person the song is for. There are some questions to help you but feel free to write whatever you like. We take the information you give us and craft it into lyrics before putting music to it to make your song. We pride ourselves on customer service. You can call, email, text or send a carrier pigeon to us with further instruction and we will be happy to flex. We send your song via email as an MP3 (or post CD) and you can play it immediately. We also send you a copy of your lyrics sheet. Free Revision – Anything you want changed in your song? No problem – just ask, no cost! We write your unique song using guitar or piano based off what style you would like. The simplicity of an acoustic song gets straight to the heart! Listen to acoustic samples here. A produced song means we add extra instruments (drums, bass, electric guitar, keys) to give the song a fuller feel. This is closer to what you might hear from bands on the radio and can add an emotional and fun element to your song. Listen to Produced Sample Songs Here. With your personalised song, you will be getting an aural treat to last a lifetime. However, we can step it up a notch with a personalised music video! We include photos of your choice and home video snippets when possible. You can put your custom music video on the laptop or big screen at a party and ensure the best possible first impression. We have had the pleasure of working on advertising campaigns with great brands like Jacob’s Creek, Oreo and Bankwest even winning an international award for most innovative use of content. We have also also worked on private gigs for companies like CBA and CityJet and enjoy every new challenge we tackle! "Hi John and Andy, Wow, what a song! Absolutely love it! You really captured the feeling and tone in the song that I was hoping for. We couldn't be happier- she had to hold back tears after listening to it. Thanks again for this unique experience"
"Got it, LOVE IT.... and my husband thought it was unreal. A gift that's so different but has so much love and meaning in it. I will be spreading the word about what you guys do. One very very happy customer. Thanks guys." "Are you serious??? - super super fast - you are amazing!!! Thank you so much!!!!! I just cant believe how amazing your customer service is - one very satisfied customer!" Words cannot describe how much I love the song! Thank you so much, this is the best gift I could ever have wished for to give my hubby. I will absolutely be spreading the word and singing your praises to everyone I know! Thank you again and again, you are geniuses! "Just a bit of feedback. She liked it so much she shed a few tears, in a good way of course! Cheers and thanks again, couldn’t have worked out better"